In this month’s Design Tip I’m using methods from my “IT’S THE LEAST I CAN DO” program! You will be learning life changing techniques that will give you the most vibrational bang for the least amount of work! You will learn how to deliberately guide powerful, positive energy into your life by making simple changes to your home. Changes you can make in a day! Changes that are often FREE! Changes you can do yourself! Designs that will literally make your home a transmitting station to the Universe! It doesn’t matter if you own a 10,000 sq ft home or rent a small trailer. It doesn’t matter how much money is in your bank account!! It doesn’t matter if you partner shares your vision. When you follow these steps, it will work for you. THERE IS ABSOLUTELY NOTHING I CAN’T DO, BE OR HAVE! This is your grounding thought throughout the process. Dream BIG! DO not worry about money or anyone else’s opinion. BE open to the notion that you can manifest unlimited abundance. Imagine the jet streams of abundance flowing freely into your life. With these designs, you will HAVE everything you are wanting drawn to you easily and effortlessly. Creating energy is not enough! Random energy generates random results! The last thing you want is to be randomly running around in energetic circles! Do you know the definition of insanity? You are going to create a VORTEX! A vortex that draws new positive energy toward you, not a circle that gathers more of the same old energy! YOU WANT MORE…. new experiences, more abundance! Wanting more is awesome, but wanting more with a well-defined plan is POWERFUL! Creating your powerful design plan requires focus. The same kind of focus you would use if you were looking for a new job or starting a business. Your first step is to define what you want! You don’t want just any ole job! You don’t want to start any ole business! You don’t want any old life, you want YOUR NEWLIFE! Designed specifically and powerfully JUST FOR YOU! So, let’s take a little time to focus and develop your Newlife Plan. Take a few minutes to think about what you are really wanting! Super quick and easy! DON’T SPEND A LOT OF TIME ON THIS! Write 3 things that you want. It could be better relationships. It could be a new car. It could be a restful vacation! Write 3 things very quickly. Don’t over think! They don’t have to be realistic, in fact it’s almost better that they aren’t!! Try to include as much detail as you can without getting bogged down. The Universe loves a clearly defined message, so saying I want to be happy is not going to be specific enough! If you can, include a bit of the reasons why you want these things or even how you’re going to feel when you receive them. For example: I want a new job where I make $150,000/yr and work 20hrs/wk because I want to have enough time and money to travel. Experiencing new places makes me feel worldly. Feeling worldly feels awesome! If you can’t think of anything, try the Simple Focus Meditation described below! It should help focus your mind in about 5 minutes! Remember, my darlings, you can not do this wrong! If you come up with one thing, that is enough! Write down your one thing and expand on the reasons why and the results you anticipate! This list is not written in stone, it’s a fluid evolving plan. As the Universe starts to deliver on your message and your plan unfolds, you might want to make adjustments and modifications! Keep defining and redefining your list. Your desires are supposed to evolve along the way! How boring would life be if we got what we wanted and didn’t want more…. Your Personal Guidance System to tell you if you’re on the right track or if you need to reorganize your priorities. Some of us have so many ideas and desires, it’s hard to settle down long enough to actually focus on them. If that’s YOU, try this simple meditation to help calm your mind and sort your thoughts! This simple technique helps calm the Monkey Mind! Give it 5 minutes! You should be focused enough to think of your 3 things by then. I use this meditation if I’m having trouble sleeping too! It works really works! OK YOU’RE READY TO DESIGN NOW!! You’ve set your intentions and now you’re ready to begin your Newlife Design Plan. The design portion of the process starts with a reality check. Remember, we’re on the IT’S THE LEAST I CAN DO program, so we’re not going to be tearing down any walls or doing any construction - You want immediate gratification! Sketch your floor plan to identify Focal Points and Energy Blocks! In this example, there’s great natural symmetry and balance! There are two windows on either side of the front door and two balanced rooms on either side. I really like how the front door is set back a bit. It adds dimension and depth, drawing you into the home. On our floor plan, we can’t tell if the front door is solid or glass. I’m going to assume it’s all glass. Many people find a glass front door appealing. The truth is, in most cases, an all glass entry puts you in a very vulnerable position energetically, especially if there’s a window or glass door on the opposite wall. The energy just flows straight through the house! YIKES! THE ENERGY FLOWS RIGHT THROUGH THE HOUSE! In our floor plan example, the primary Focal Point is the Living Room! You want the energy to flow straight back to the Living Room and you want it to stay there! Place tall potted plants in front of the side windows - again using pots in the color specific to your desires is best! Add a window treatment to the center door - Another opportunity to use color, especially if you don’t want to paint your door! In this design, they’ve ignited the energy with pattern on the floor, wall and ceiling! This may be a bit of overkill, but it certainly draws your attention and keeps you engaged! In design, form always follows function! It’s super important to be aware that each space has a function, even if it’s just a walkway. Every space needs to be purposefully designed to support it’s function. So, before we move on the developing the design for the Living Room, I want to talk about the Foyer and it’s function. The last thing you want in your Foyer is a dumping ground! You absolutely want to have a place to put your keys, an umbrella, and of course a mirror to check your teeth before you greet your guests or leave the house. You may also need a place to hang a jacket and put your shoes. You don’t want your Foyer to be cluttered so, this can be a delicate balancing act! You want to have an organized and functional Foyer. When you look at this floor plan, the only space available for this catch-all area is to the left of the front door. The Universe thrives on symmetry, balance and cohesive flowing energy. 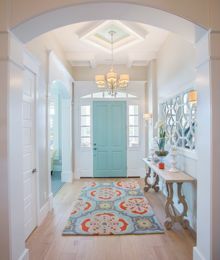 Here are a few examples of Foyer styles that illustrate symmetry, balance and energetic flow! You may not find all of these designs appealing or applicable to your situation, but I’d like you to look at them and see if you can find the Focal Point in each design. Is there symmetry or asymmetry? Is the space balanced? How have they used texture and/or color to add energy and interest? 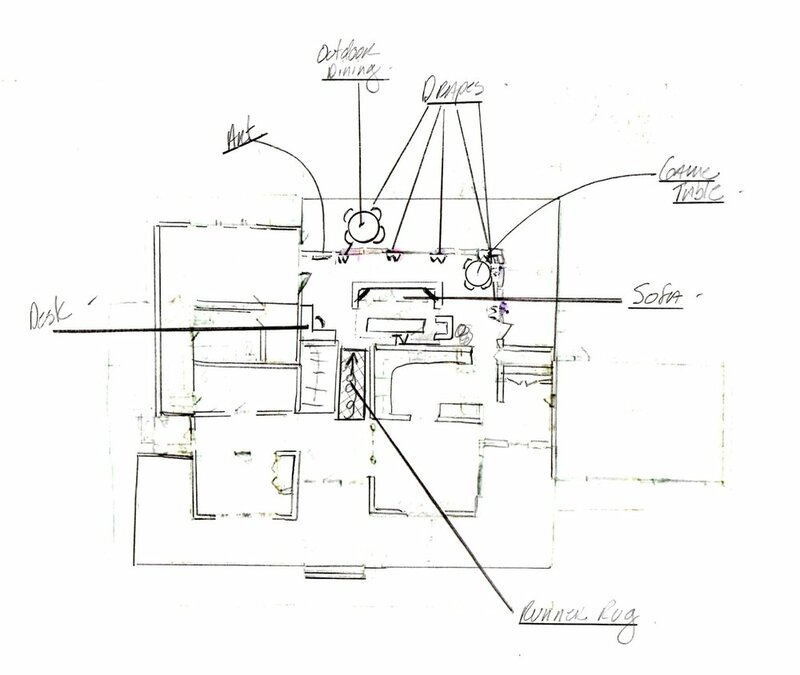 The reality in this floor plan is that as you walk inside, you are “confronted” with a flight of stairs and two rooms on either side of the entry. At least half the energy goes right up stairs and actually distracts from your goal of guiding the energy to your primary Focal Point of the Living Room, especially if the stairs have a bold colored carpet. Keep the color palette of the side rooms neutral. 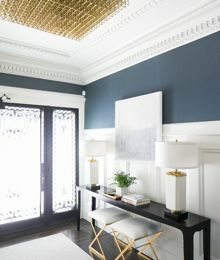 You could also paint the Living Room walls a contrasting color to the entry. Let’s move on to the Living Room and determine our energetic options. We are going to use the same process throughout the house! Where is the focal point of the Living Room? Is it a natural focal point or do you have to force one? What is the function of the room? What kinds of activities will be happening in the space. What kind of furniture will I need for seating, work space, games and or eating? This family wants a casual, family friendly home where they can put their feet up, watch TV, have a designated work space, a game table and a reading area! Don’t we all! Everything will radiate from the Focal Point, so let’s figure that out first! Watching TV is the primary function in this room. The only full wall where the TV could go is the wall on the other side of the kitchen, opposite the sliding doors. So, we’re going to have to “float” the casual seating area in front of the sliders. Floating just means that the furniture is floating in the room and not against a wall. Be sure to leave at least 30” between the sliders and the back of the sofa. You’ll also need about 18” between the front of the sofa and the coffee table. I would slightly offset the sofa a bit to the left of the TV wall, rather than centering it on the wall. Sliding it left, will allow you to see just enough of the arm and a pillow from the entry. This will help to draw the energy to the main living area, as well. Then I would place an arm chair to the right side of the sofa with a floor lamp. This will be the reading area. I’m easily distracted, so I need my work space to be as far away from the TV as possible. When I look at this space, it seems that an L shaped desk tucked in the corner behind the stairs would be the perfect location. With proper lighting, this could be very cozy! Don’t forget storage! The game table, which can also double as an eating area, would be terrific in the window corner. Plenty of light to see the puzzle pieces! There are plenty of windows and therefore it is likely that there is plenty of light. I like the idea of having ceiling to floor drapes to add height, texture and warmth to the space. Also, easy to close to prevent glare on the TV. These are all things that hold the energy in without blocking light or the depth of the outdoor living area. Use this same process throughout the house, keeping a big picture perspective! Define your Newlife Plan, do a reality check of the space, determine your Focal Points and build your design to radiate from that Focal Point using colors that represent your Newlife Plan! Add texture, aroma and music to ignite your senses even further in the direction of your desires! and powered by your well defined desires. 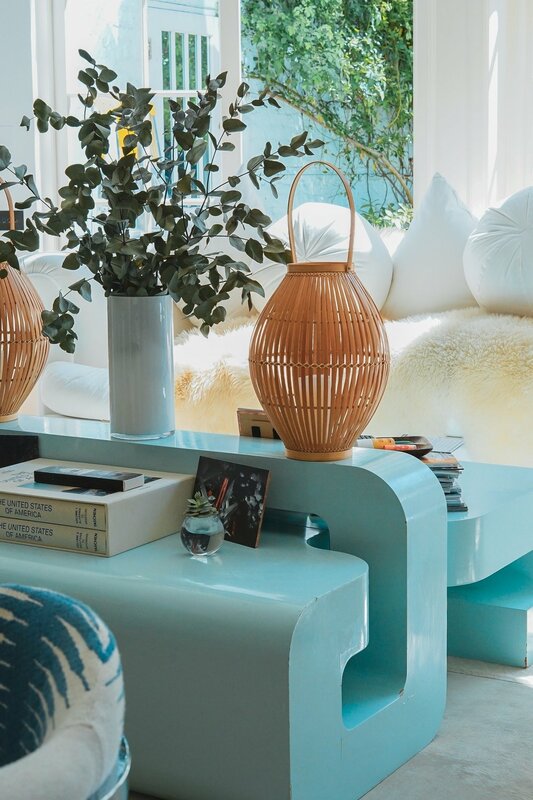 Every color, every piece of furniture and accessory is a visual trigger that amplifies your vibrational connection to Source! Next step, pour a nice glass of wine, grab your comfy blanket, light a candle and your favorite playlist! I sincerely hope you are enjoying the Design Tips! I’d love to hear from you about what’s working and what’s not! GUIDE TO LIVING IN ABUNDANCE.